I’m not sure what to say about The Silver Dream to be honest. It’s good … just not as good as the first book in the series, InterWorld. It’s an interesting story and very well-written, but it just felt like an unnecessary continuation of the first book. I guess it would have been better if the story was a stand alone book, instead of a series. I know there is a third book in the InterWorld series called Eternity’s Wheel, but I’m not sure I want to read it. I have a feeling it will just be more of the same, and with my ever-growing TBR pile staring at me from the corner of my room I think my time would be better spent working on that pile. I have to say it was a bit disappointing finding out that Neil Gaiman didn’t actually write The Silver Dream. According to Goodreads, he created the world and co-wrote the first book, InterWorld (that’s why he’s credited in the cover) but he didn’t write the rest of the series. They were actually written by Michael and Mallory Reaves. One of the best features of the story was the introduction of a new way to travel (No spoilers! ), which made the story more interesting and exciting. 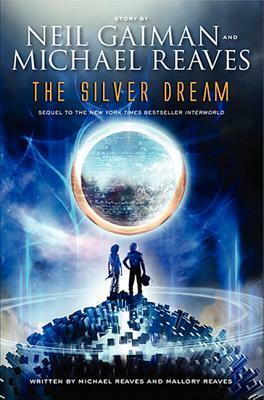 Overall, The Silver Dream is a good story with an interesting plot and a brilliant range of characters.